Construction work converting the M62 to a smart motorway is to start this weekend. 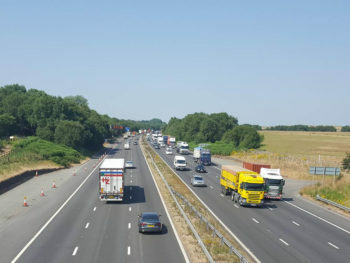 The work, which will increase the capacity of the nine-mile motorway by a third according to Highways England, will see an extra lane added in each direction on the M62, which links the M6 to the M60. Temporary narrow lanes will begin to be introduced on a three-mile stretch of the M62 near junction 12 this weekend to allow contractors to work at the side of the motorway, and a 50mph speed limit will be deployed. The roadworks will be gradually extended to junction 10 during the autumn and the smart motorway scheme is due to be completed by spring 2020. Malcolm Carter, project manager at Highways England, said: “We are doing everything we can to minimise disruption during the scheme, including keeping all lanes open during the day and only closing parts of the motorway overnight when traffic levels are much lower. This scheme is one of four new smart motorway projects in the North West, which will all begin construction work within the next 18 months, adding over 100 miles of extra lanes to the region’s roads.